If you follow on Facebook or Twitter you saw this weekend that today I had a special announcement! 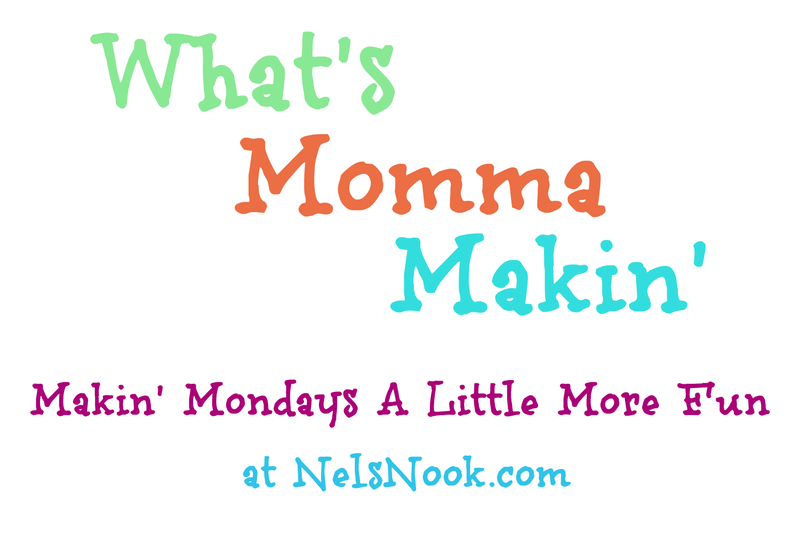 Well here it is - my mom will be joining us every week for What's Momma Makin' Mondays! 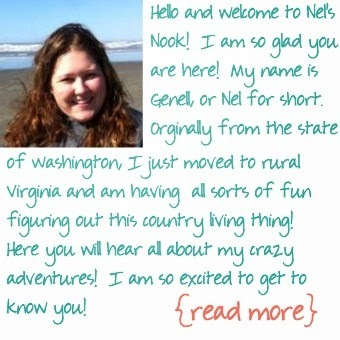 You guys I am so excited that she will be joining me - we have always loved to cook together but now that we are over 2,000 miles apart that's a little difficult to do! Let me tell you a little bit about my mom - she is freakin' superwoman (I am not kidding I swear she has a cape some days!). She spent my childhood creating some awesome memories - she can throw a party like nobody's business (especially a Halloween party!). She is an amazing cook and everyone is always welcome at her table. My brother had a friend growing up who we swore knew exactly when my mom was done cooking dinner because he would be at our front door ready to eat! But more than anything she is my biggest supporter and one of my best friends - it doesn't matter what crazy idea I have she will be there with bells on ready to go (expect maybe when I told her we were moving - not her favorite idea but she still helped me pack!). And today she brought cake! Now I just wish I was back home to have a piece! So without further ado here is my mom! Hello! I am Genell's mom but you can just call me Lora Liz. I grew up in a very large family (think 13 kids!) that has always celebrated every holiday together. We have even been known to make up holidays or take up other country’s holidays as an excuse to get together and celebrate something. Oktoberfest is one such holiday for my family. Not long after one of my brothers and his family moved back to the U.S., after having spent over a decade in Germany, we began incorporating Oktoberfest into our holiday line up. After all, who doesn’t enjoy an excuse to get together and eat lots of food and drink imported beer?? My brother and dad will make traditional foods like Weiner Schnitzel (veal), Schwenkbraten (grilled pork), Brats with sauerkraut and other interesting grilled meats. I’m sure these are authentic recipes brought back from Germany by my brother, they are enjoyed by many members of the family and various friends who attend annually. However, I am not personally a huge fan so I always try to look for tasty alternatives to bring along and add to the potluck table. This year I am bringing German Chocolate Cake. Knowing I would be sharing it with you, I was curious to know the history of this German classic. As it turns out, my family’s classic German dessert is anything but German! An employee of the Baker’s Chocolate Company by the name of Sam German invented Chocolate Baking squares in America about 1852. Baker’s German’s Sweet Chocolate is named after him and is what was eventually used in the first published recipe in1952 by a Texas housewife to make what has become known as German Chocolate Cake. So much for authentic German on the cake recipe…… Not one to be easily discouraged and also as someone who is more interested in enjoying a great food at a potluck than with authenticity, I have no plans of changing my menu for the party. If they have not figured out in all these years that the dishes they serve are not German but have enjoyed them anyway, who am I to burst their bubble?? I hope your family will enjoy the cake as much as our does! Preheat oven to 350 degrees. Grease and flour 3 - 9 inch round pans. In a small saucepan, heat water and 6 ounces chocolate until melted. Remove from heat and cool. Pour batter equally into your pans and bake for 20 minutes, or until a toothpick inserted into the center of the cake comes out clean (may take up to 25 but start with 20 and check often, 9 inch will bake faster). Allow to cool for 10 minutes in the pan, then turn out onto wire rack. To make the Frosting: Lightly toast coconut and pecans, let cool, watch the oven closely as the coconut browns quickly. In a saucepan combine 1-1/2 cups sugar, evaporated milk, 3/4 cup butter, and 4 egg yolks. Cook over low heat, stirring constantly until thickened. Remove from heat. Stir in coconut, pecans and vanilla. Cool until thick enough to spread. Spread filling between layers and on top of cake. To make the Chocolate Drizzle: In a small saucepan, melt shortening and 1 ounce of chocolate. Stir until smooth and drizzle down the sides of the cake. Does your family celebrate Octoberfest? What are your favorite traditional foods? Thank you! I didn't get to try the original since I live so far away from my mom but everyone raved about it! It's on my list of things to make soon! Thanks for stopping by! When you try it let me know how you like it! how do I cooy this to my home page? Hello and thanks for stopping by! I am not sure what you mean by copying it to your home page. You can bookmark it which will save the link or if you go to the facebook page - www.facebook.com/NelsNook its there and if you click "Share" it will save it to your facebook page. I hope this was helpful! Please let me know if you have any questions. 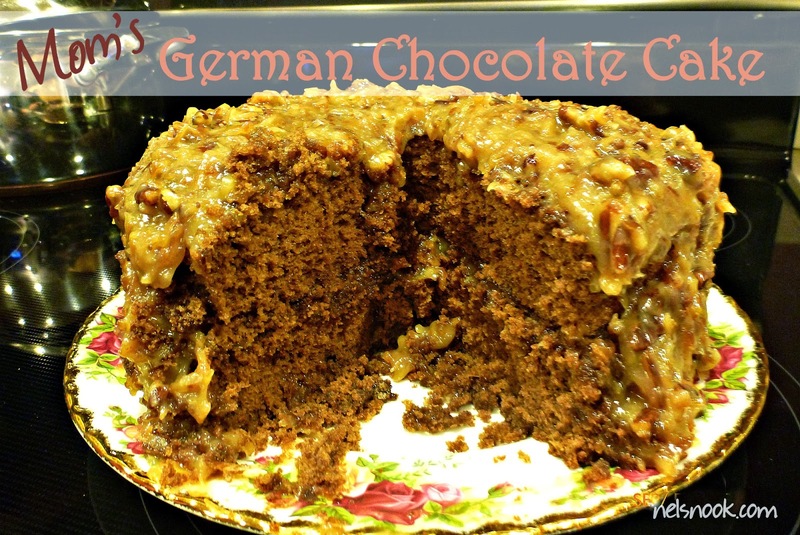 May I PLEASE have this recipe.....I LOVE REAL GERMAN CHOCOLATE CAKE & THIS IS DEFINETLY REAL!!!!!!! My Grandpa & Grandma were German.......I SO LOVED GRANDMA'S GERMAN CHOCOLATE CAKE & GERMAN POTATO SALAD.....haven't had any since I was a little girl!!!!! If you have a recipe for German Potato Salad....I'd REALLY APPRECIATE THAT TOO!!!!!! Thank you so much for your sweet words! I am so glad that you like the recipes - that means so much to me!